Could someone please post a screen capture of the input window to model these two cabinets in "Hornresp" with the stock K-33 driver. Searching around, I am finding conflicting information. I have the means to measure my cabinets response and may try some other drivers if the "Hornresp" analysis and measurements would make it interesting enough to try. I don't have the LaScala, and I don't have an actual KHorn to measure, but the attached model was adapted from very precise measurements of an old Speakerlab K. I understand that, dimensionally at least, the K is a very good match. Others may want to comment about that. 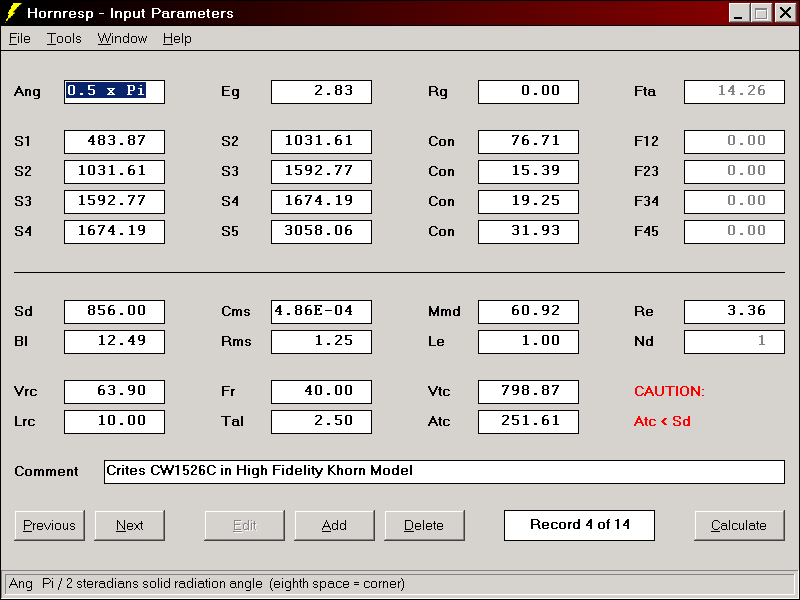 Could you post the TS parameters for the current model K33E that you used and the source for them? I cant seem to find reliable information. I'm very interested in the horn models that you come up with for the LaScala. I've tried to do it a few times, but I haven't been able to find sufficient dimensions for accurately entering the horn into hornresp. There are plans here http://hornloudspeakermagazine.blogspot.com/2008/11/comprehensive-list-of-klipsch-plans.html. I cannot vouch for them; I found them with a Google search. To get my KHorn model, I entered the Speakerlab K plans into my CAD program, then extracted and unfolded the acoustical path. 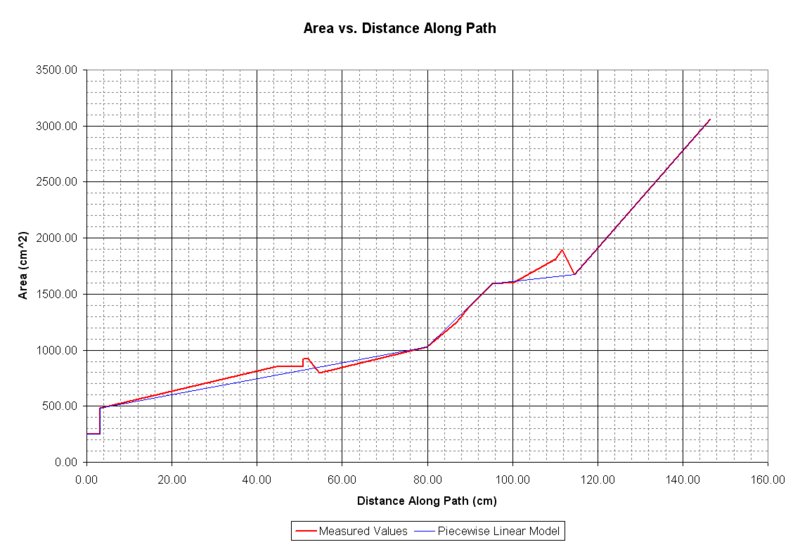 I took an area measurement at every point where a significant "change" in the path occurred (corners, kinks, etc. ), and plotted the results. Then I created a piecewise linear model for Hornresp. I've attached that plot. The red line is the actual area; the blue line is the Hornresp model. Does modelling as exponential in hornresp get you closer to the red curve at all (not that you're far off in the first place)? I'd be kinda curious to see the exponential curve on that plot anyway since I know that is something PWK was aiming for despite all the folds. But if it's too difficult then don't worry about it. Does modelling as exponential in hornresp get you closer to the red curve at all (not that you're far off in the first place)? I doubt it. The devil is in the details. See the "bump" in the curve at around the 96 cm point? Reduce the area there from ~1600 cm^2 to ~1250 cm^2, and Hornresp says that the peaks and valleys in the frequency response will be reduced significantly. An exponential model wouldn't even see that bump in the first place. I evaluated dozens of current production 15" drivers and could only find a few that would outperform the stock K33 by any significant amount. Here they are all on one graph. The Bob Crites driver is the only 4 ohm impedance "direct" replacement in the group. I tried to match the responses at 100 Hz so they would be relatively easy to compare. I'm not sure if all these drivers will fit. I'll model the same drivers in the La Scala next. I'll model the same drivers in the La Scala next. Coincidentally, here's a LaScala model that I worked up last night, from plans here. And a Belle, from here. Here are the same drivers I identified for the Khorn in the La Scala all on one graph. The Bob Crites driver is the only 4 ohm impedance "direct" replacement in the group.I tried to match the peak responses so they would be relatively easy to compare. I'm not sure if all these drivers will fit. The response is modeled with the speaker in "quarter space" (on the floor backed up to a wall). The drop in response below 100 Hz is consistent with my Audyssey setup results which recommended a 100 Hz crossover from the La Scala to the subwoofer. 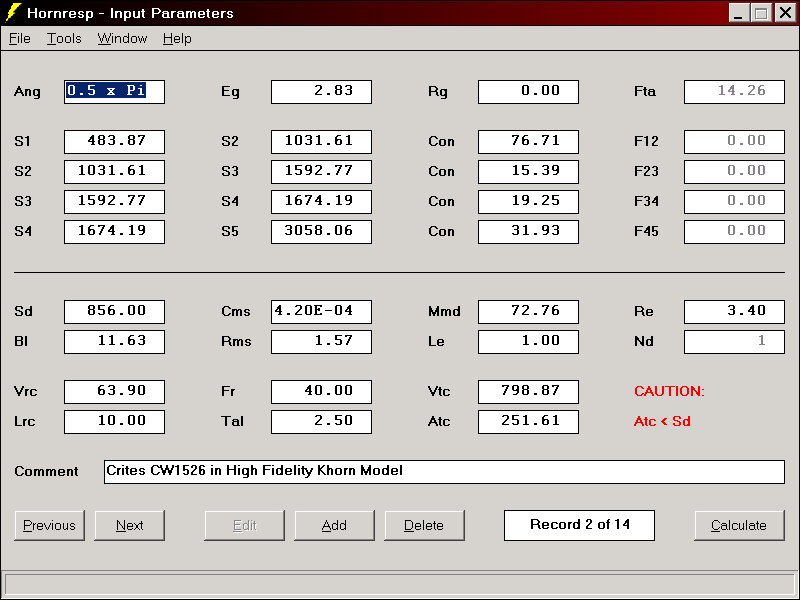 Here are the Hornresp setup files and the driver parameters that I used. That's interesting that the 150Hz hump shows up in the models too....could always EQ it out and get away with a lower xover frequency. 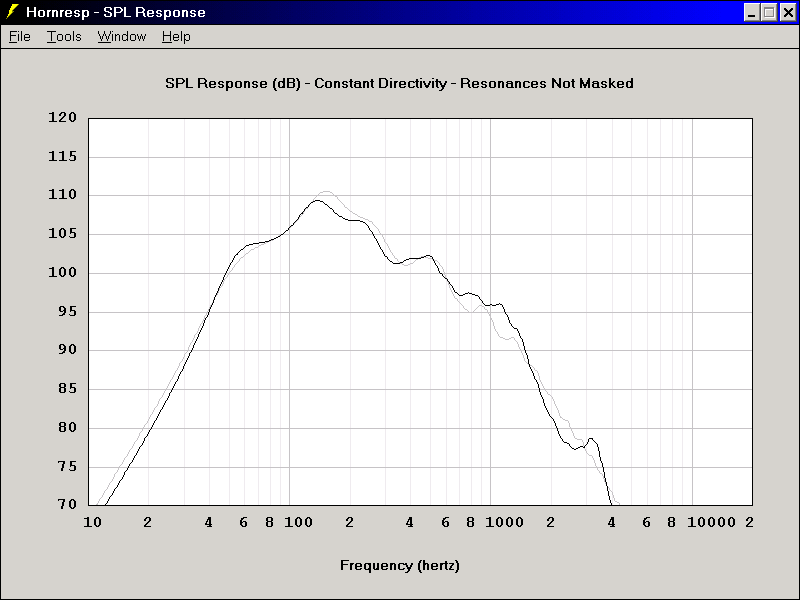 Yes, flat response down to 80 Hz looks possible for the LaScala by pulling down the peak. I'm going to give this Ciare 15.64 NdW1 a try. Available at Assistance Audio This is a Neo magnet woofer with lower mechanical damping and a more powerful motor (than the K-33) for quick high impact response. Edit: K33E in both cases.